National debt is one of the most debated issues in politics. After the global recession, people began questioning debt and the implications of too much debt. While some country’s have high debt and some have low, a better measure is the amount of debt dividend by population. Take a look at the map below to see how much people in each country owe towards their country’s debt. In the map above, you can see each country with a number representing the amount of money each person owes towards the country’s debt. 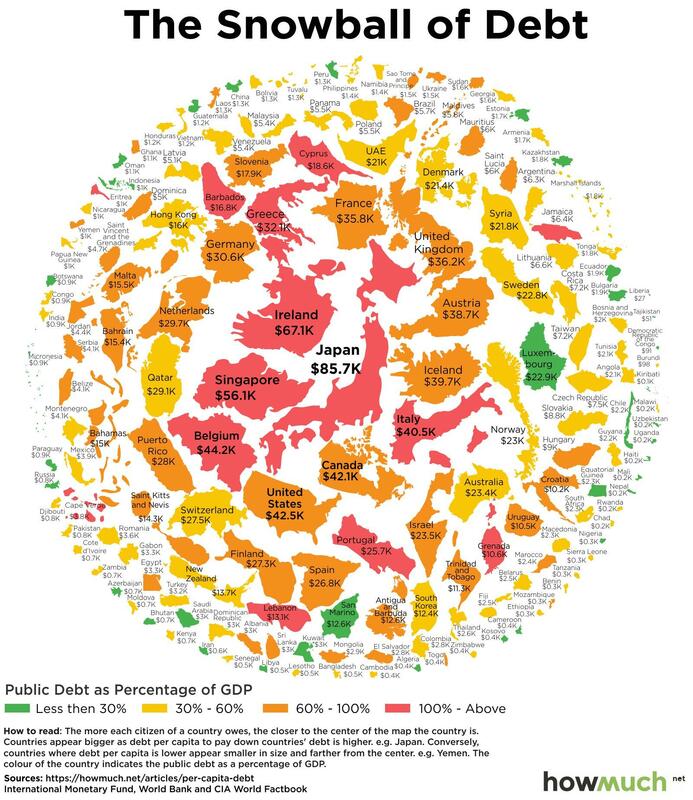 In the legend, countries are designated a color based on public debt as a percentage of GDP. The more each citizen of a country owes, the closer to the center of the map the country is. All figures are in US dollars. Right in the center of the map lies Japan, the country with the highest amount of debt owed by each person. Japan has been piling up debt since its “economic miracle” wore off in the 1990s. Each Japanese person owes $85,694.87 towards Japan’s national debt, far more than any other country. Ireland also stands out from the crowd, with each Irish person owing $67,147.59 towards Ireland’s national debt. All of the other countries with a high amount of debt owed per person are developed nations like the United States, Belgium, Austria, United Kingdom, Italy, Germany and others. Developed nations are able to borrow more money because investors generally trust wealthier nations will pay back debt in full. Still, many wealth nations have a staggering amount of debt owed. The countries with the lowest amount of debt owed per person are relatively poor nations. Liberians owe the least amount of money towards their country’s national debt at $27.44 per person. Other poor nations with low debt include Democratic Republic of Congo, at $90.70 per person, and Haiti, at $204.33 per person. Poor nations usually do not have the opportunity to take on national debt because investors are unwilling to offer loans to these nations. There are a few exceptions to the trend of poorer nations owing the least amount towards debt per person. Taiwan is a relatively wealthy nation with a large economy compared to the size of its population, but each Taiwanese citizen only owes $7,223.90 towards Taiwan’s national debt. The trend in the chart is pretty clear: wealthier nations have more debt. Japan, Ireland and Singapore are above the trend, with Japanese people in particular owing a lot towards their country’s debt. People living in developed countries owe quite a bit towards their country’s national debt, while people living in undeveloped nations owe very little.